A flavor-packed collection of 65 recipes from the trio behind the premier pops stand in the country, People’s Pops. In 2008, three old friends had a hunch that the world deserved a better ice pop. Every summer since, New York City’s been taken by storm with out-of-the-box flavors like Raspberries & Basil, Peach & Bourbon, and Cantaloupe & Tarragon from People’s Pops. Now, the People behind the phenomenon share their DIY ethos in a breezy cookbook that teaches how to pair ingredients, balance sweetness, and explore fruits (and vegetables and herbs!) --in simple recipes that work with standard ice pop molds or improvised ones. 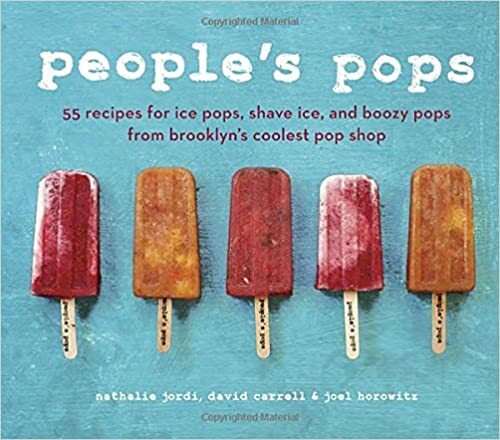 With a chapter devoted to shave ice plus recipes for grownup boozy pops sprinkled throughout, People’s Pops proves itself top of the pops.